This Flamin’ Hot Cheetos Fried Chicken recipe is sure to be a fan favorite the next time you have friends over! Did I mention it is easy to make! No measuring cups needed here. Place chicken into a glass bowl. Pour buttermilk over chicken until fully coated. For a spicier taste, sprinkle chicken with cayenne pepper or hot sauce before coating in buttermilk. Let chicken marinate in the refrigerator for 2 to 8 hours. Pour crushed Flamin’ Hot Cheetos on a plate. Pour out buttermilk and rinse the chicken. 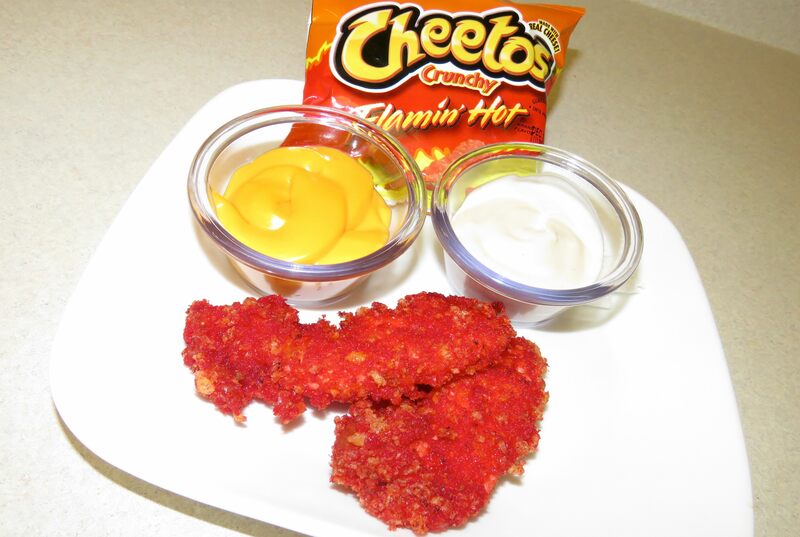 Coat both sides of the chicken in the crushed Flamin’ Hot Cheetos. Heat oil or warm up the oven. Obviously the oven method is slightly more healthy. Your call. If you are frying the chicken, heat oil in deep fryer to 325F. If you are baking, preheat oven to 375F. *Cook until internal temperature is 165 degrees F.